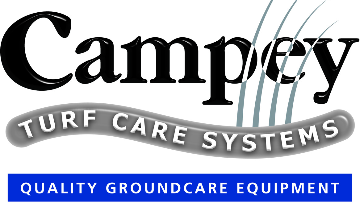 Campey Turf Care Systems is celebrating over 30 years of successful trading this year. This achievement is down to providing excellent machines which outperform its competitors and give excellent value for money. The equipment is reliable delivering the highest standards of build and longevity. What sets Campeys apart from other dealers is its ideal of providing the machinery which will deliver best practice when it comes to renovating and maintaining natural turf. Campeys has a team of 7 UK & Ireland based product specialists to provide on-site information and demonstrations and an in house staff of 30 ensuring the engine is well-oiled and everything from processing orders, delivering machines and dealing with all your requests, is fast, efficient and to deadline. They also provide a full back-up service and spare parts provision. This is fully supported by only dealing with the best global manufacturers, including Imants, Dakota, Koro, Vredo, GT Air Injection and Raycam. Campeys are able to supply worldwide, from here in the UK to as far away as New Zealand, Asia, Europe, Africa, and North & South America. With customers ranging from Real Madrid FC, LA Galaxy, FC Dallas, Arsenal FC, Manchester United FC, Liverpool FC, Castle Stuart GC, Royal Liverpool GC, Royal Birkdale GC, Tameside Metro. Borough Council, Warrington Borough Council and Pendle Borough Council just to name a few. We carry in stock at any one time a value of £500,000 worth of spare parts, we are therefore able to despatch within 24 hours worldwide any spare part our customer’s require. If we by any chance do not have the part in stock, we are able to call up on the manufacturer to despatch it direct. We have 4 workshop technicians all qualified and trained on the repair / maintenance of sports turf maintenance equipment. Our youngest member of the workshop staff has just completed his Land Based Engineering Apprenticeship 2013-2016 and has received the Best Academic Apprentice. We also have a mobile workshop technician who is able to carry out repairs / service on our customer’s site.